Pot pie is the definition of comfort food, and perfect during the fall and winter months. It’s warm, filling and basically chicken soup with less liquid and dough on top. I’ve made pot pie with a full-on, grain-free almond flour crust in the past and it definitely involves a bit more work and planning. It’s the step that I usually want to skip, so this time I decided to come up with a shortcut. What I came up with still offers a buttery, slightly crispy topping, but involves no dough rolling period. 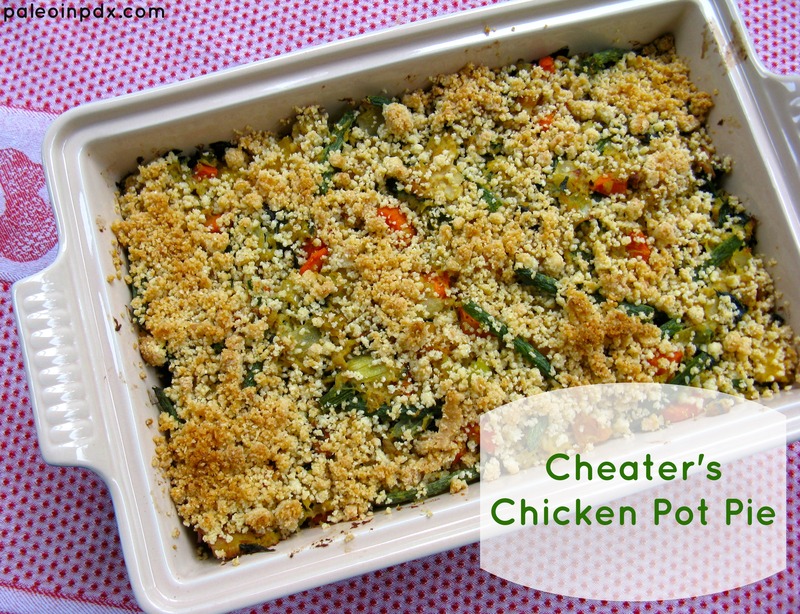 Enter the cheater’s chicken pot pie with almond flour crumb topping. It’s a major time saver and nice if you don’t have all the dough ingredients on hand as well. I was very pleased with the results and hope you are too! Melt the butter in a large pot over medium heat. Add the onion, garlic, carrots and celery, and stir. After a few minutes, add the squash. Stir and continue to cook. Stir in the chicken and add the broth. After a minute or two, add the sea salt, pepper, turmeric and fresh parsley. Next, add the coconut milk and green beans, and stir well. Cook 3-4 more minutes and if mixture seems like it needs more liquid, add a bit more broth. Remove from heat and pour mixture into a 2-quart casserole dish. Sprinkle almond flour topping evenly over the top (recipe below) and place in oven, uncovered. Bake for 20-30 minutes or until golden brown on top. In a small skillet, melt the butter over medium heat. Reduce the heat to medium-low and add the almond flour and a pinch of sea salt. Mix well, until almond flour is coated in the butter (it will be in small clumps). 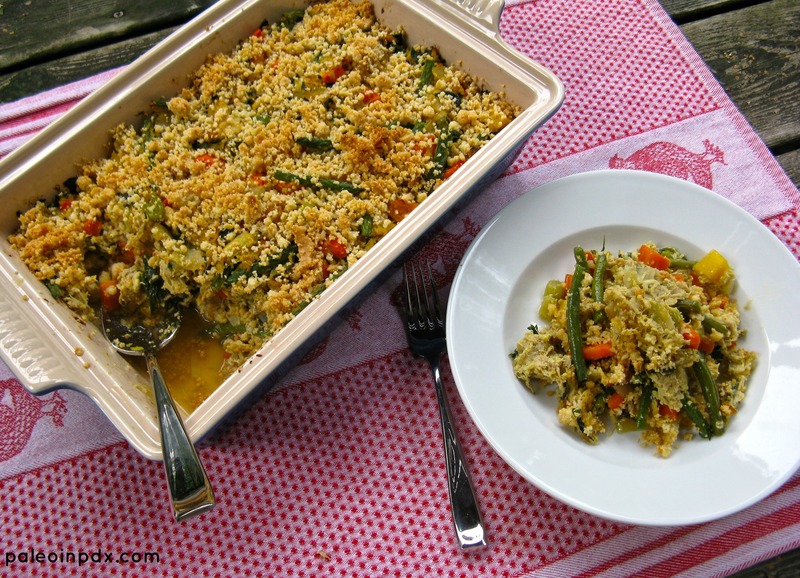 Remove from heat and use atop of the filling, once it’s been poured into the casserole dish. Good to hear because I was a bit rushed when doing this! I was hurriedly trying to get it done before having to leave and meet a client, and did get it done in time, but it came at the expense of some grammar errors! I’ve since fixed them, but I’m glad the photos look good! Hehe yeh I know same with Joe. The other day he said to me, what are we going to do when we go to Australia, I really like the way we eat here and I also really love the food you make. Oh, how wonderful! I appreciate you sharing my recipe and thanks for providing the link. I’ll be sure to check it out!